If the mood strikes and you find yourself craving something sweet and peanut buttery, this recipe is for you. 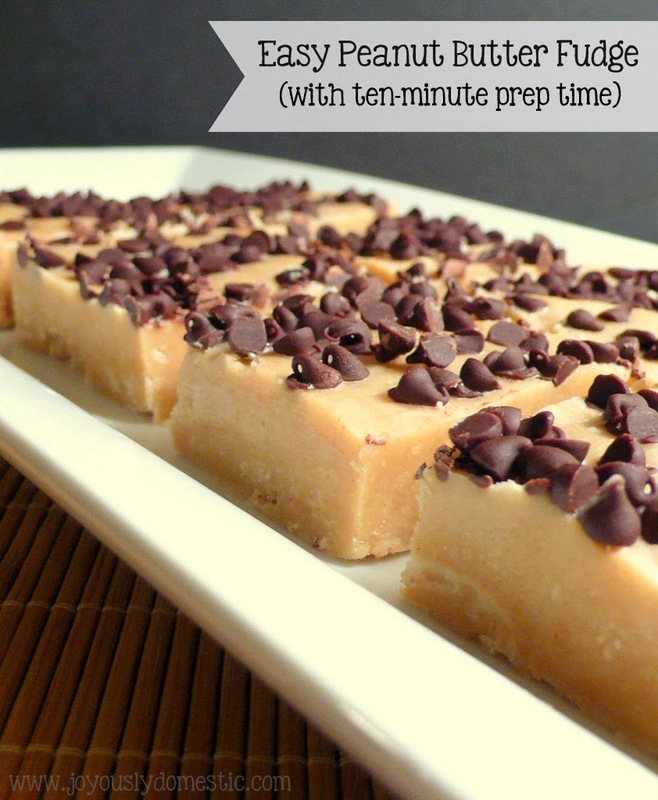 You won't believe how quick and easy it is to whip up peanut butter fudge using this recipe. Seriously, I was in and out of the kitchen in less than ten minutes making this. And, the recipe requires just a few simple ingredients that most of us keep on hand. I chose to "gild the lily" by adding some mini chocolate chips to the top of the fudge, but that is pure preference and totally optional. Combine the butter and peanut butter over medium heat in a saucepan. Cook just until everything is thoroughly melted and smooth. Remove from heat. Stir in vanilla and salt (if using). Whip in powdered sugar. Refrigerate for an hour (or until chilled and set). Cut into squares (in whatever size you desire). Mmmm!! No thermometer required! I'll bet you could put those chips on while it's still hot, let them melt a little and then marble them in.